What spacing has become for us is a concept structure that incorporates different components to be able to give us a true spacing concept with 5 receivers spaced horizontally across the lower intermediate area of the defense. We’ve added multiplicity to the concept by changing the responsibility of one receiver to get us into what many offenses consider a separate concept. In fact, in some offenses what we included as part of one teaching structure would exist as up to 5 different concepts. Incorporating several variations into one teaching structure makes it very easy for our players to learn, for us to practice, and it gives us clarity in how we game plan in that we make decision on which components we will use within the spacing concept to attack an opponent in any given week. In my library of resources, I have books that I re-read and refer back to every off season. Primarily these are books that provide a sound offensive structure for incorporating an offensive idea, and give the details to make those ideas successful. 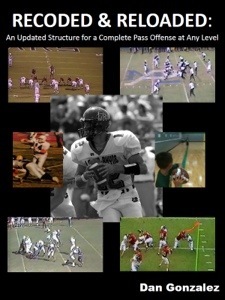 Dan’ s first book, Concept Passing: Teaching the Modern Passing Game is one of those resources. He didn’t necessarily present any information that was new to me from a passing play perspective, but he did present it in a very clear, concise, and logical manner structured in a way that allowed me to think differently about those pass plays. Dan’s new book, Recoded and Reloaded: An Updated Structure for a Complete Pass Offense at Any Level is another resource that provides a logical structure for offense and a new way to look at the passing game. Dan began this project, or “experiment” as he calls it, with the idea that he wanted to make the offensive structure so simple that an eight year old, particularly his son, could understand it. Dan’s first book illustrated nine different concepts and how they fit into an offensive system. While I loved how each concept was taught and how the system was built, nine concepts were too cumbersome for me to carry in an offense. Spurred by Dan’s organization and concept based teaching, I found a way to fit everything that we needed in our passing game into five concepts. I never fully adopted Dan’s system or terminology, but his first book had a huge influence on how I thought about passing. One aspect I especially liked was that Dan set up structures in the passing game that allowed his quarterback to move through a specific progression using footwork as the timing. If you stand behind me at practice you will constantly hear that coaching point being reiterated to my quarterbacks, “Take your eyes and feet through the progression.” Gonzalez’s details for each concept made it easy to translate to a quarterback. There are other resources out there that give even more detail on those types of things and in defining the idea of “open receiver” and provide more of an operating system for any concept. Both of Dan’s books are tailored to setting up concepts to attack the defense and remain focused on that. The whole idea of both of Gonzalez’s books are to provide a structure of a passing game attack that allows for multiplicity while providing a consistent teaching/coaching model. Recoded and Reloaded goes a step further than Concept Passing. In today’s modern game, the need to be streamlined in order to operate at faster tempos is necessary. 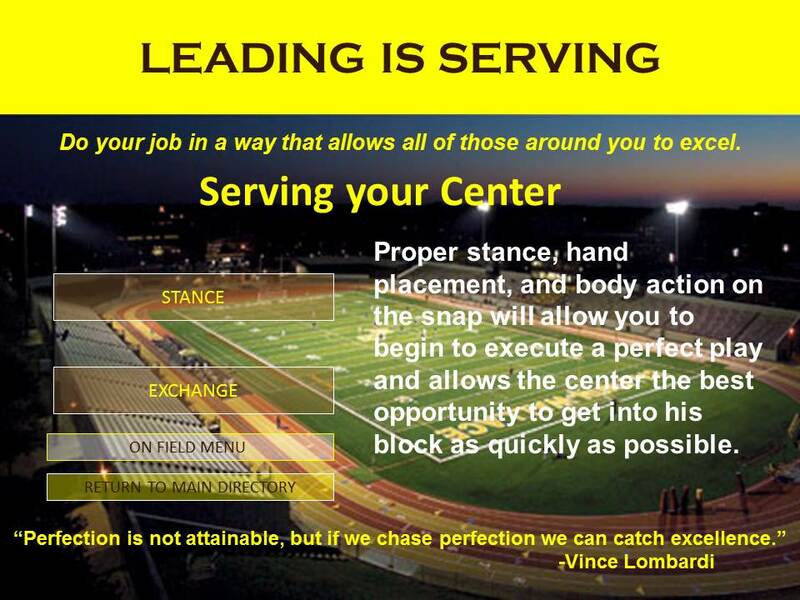 The challenge for any offensive coordinator is to balance the number of answers needed to attack a defense with simplicity. What I’ve found through studying materials is that structure and design of a system, when done properly, allow a coordinator to have the flexibility of many answers by design while translating that to a simple game plan that is practiced and performed efficiently on game day. Dan’s “experiment” does just that. He took nine concepts and found commonalities that allowed him streamline the passing game even further than he previously designed is system. This was done with the player in mind. Any good system is user friendly. In order for it to work, it must be simple for the players to use. Dan points out that streamlining for most coaches means paring down what is used by discarding it. The problem with that is that it takes away answers for an offense. He makes the point that the goal of streamlining a passing game is to maintain access to virtually any pattern structure. 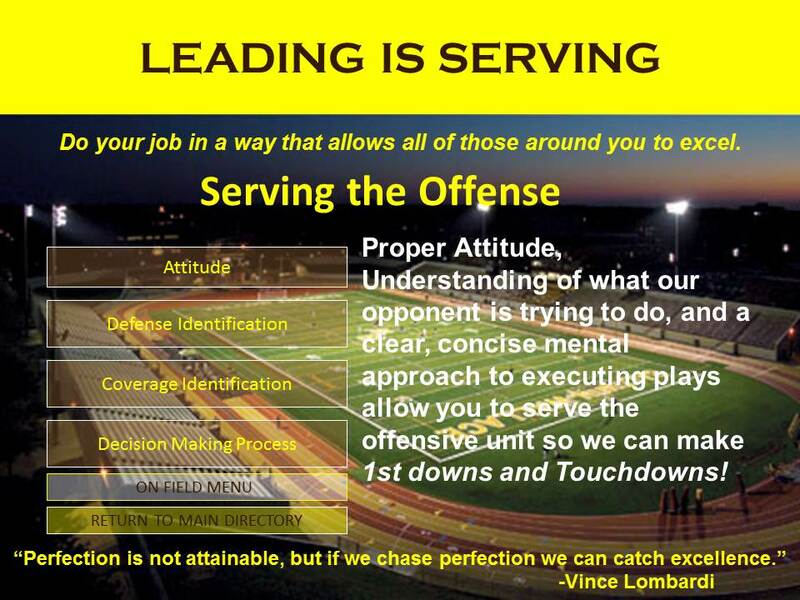 This allows for adjusting to personnel from season to season while staying out of a “grab bag” mentality of offense. The challenge is really put back on the coaches to mix and match patterns so that they attack a defense in an optimal way. 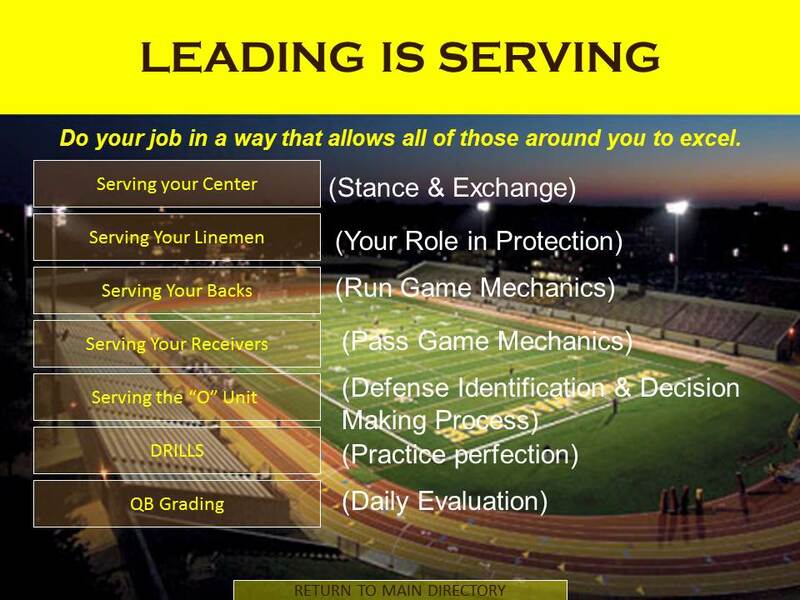 The structure maintains the consistency from week to week and season to season for the player and coaches. The book gets into the nuts and bolts of the system by explaining and illustrating a tightly integrated formation system. While most formation systems base out of an “I” formation, this one begins with a four wide receiver environment and gives simple rules for any substitute based on the type of player and his role (fullback, tight end, h-back). It’s helpful to read this section for a basic understanding of how plays are called in the book, but not necessary if you don’t have an interest in adapting a new formation system. It is a great resources though, and it certainly spurs some thought on how well your own formations adapt to different personnel and affect the teaching of concepts. From this point on, the book explains some sound rationale for how pass concepts should be created to properly stretch a defense. This leads into the “recode” and how everything boils down to three advantage principles and three read concepts. An advantage principle is the first area that is being attacked with the pass play. This can be done with a single route or with a combination of routes. The remaining routes are distributed in a way that create a line of sight for the quarterback and a specific rhythm for his eyes and feet, exactly like that described in he first book. As Dan progresses further into the book he explains the benefits of using three advantage principles and three read concepts in how they translate into practice drills. There certainly is an efficiency and carry over created in having a very flexible system that can throw many different variations at a defense over the course of a season while remaining simple in the players’ eyes. The terminology for play calling and structural tags is simple to understand and use. The idea of creating a backside combination or stretch of the defense with what is termed “third fix” was of most interest to me. It really brings the fourth and fifth receiver into play by making them a part of the passing structure instead of an afterthought. It takes the idea of “dead routes” out of the passing game and makes all five receivers a legitimate target for the quarterback while giving him a simple and logical progression to get there. When tied to protection and back releases, both detailed and illustrated in the book, it’s easy to create a passing play with the method described. Gonzalez also spends time on explaining the scramble and its importance in the passing game. He gives specific rules to receivers with sound rationale on why and how they should react when the quarterback goes into a scramble. A portion of the book goes into the practical side showings reader exactly how the system works in assembling a pass call. Understanding this allows any coach to assemble a pass play in a way that it will remain simple for the players because of the structure. Finally, a recommended installation plan is given and discussed. 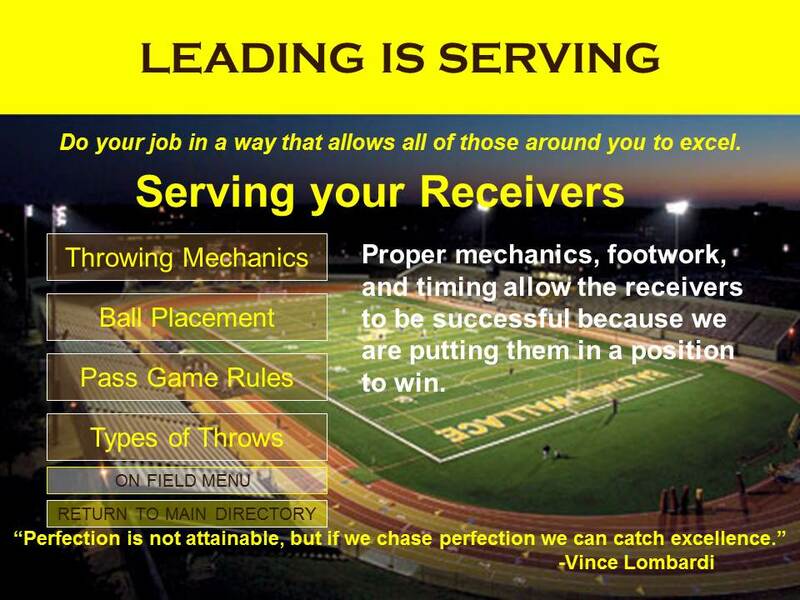 Recoded and Reloaded: An Updated Structure for a Complete Pass Offense at Any Level will provoke thought for how you have created a structure. It’s a sound system that can be incorporated in its entirety as described in he book. For many if us though, it’s a resource that can give us advantages in tweaking the design of our own system to be streamlined and player friendly. The best offenses today probably don’t look much different on the surface. If you took cut-up from one team to the next you would see many similar offensive plays. The advantage is gained for a team when it finds a way to blend simplicity and flexibility in its attack while giving the players a simple way to do all of it through a structure that creates a very clear picture in their minds through both communication of the concepts (how it’s taught) and repetition of concepts in practice. Dan Gonzalez book provides a resource that can help you do exactly that. It’s getting to be like creating a monster from spare parts ala Dr. Frankenstein. I’m seeing all kinds of great ideas recently on different blogs and forums – snag with power, sweep and screen, quick game with naked. The ideas are not necessarily new. Some of these have been around for years. Zone read bubble and stick-draw have seemed to make combination plays a topic of interest for all offensive coordinators. Here’s an interesting one in which we use our wildcat quarterback, a sweeper, and pin and pull to execute a sweep with a sweep. We are stretching both flanks. The quarterback is reading the end to the left. if he closes he will give to the sweeper. If he widens, the quarterback keeps it to the other flank on the pin and pull sweep. The power read/inverted veer is a similar concept with the front side defensive end being read. These are great plays for uptempo procedures. However, like anything, they must be practiced and executed with high efficiency. Procedurally, offenses are looking to use picture boards or one-word calls to execute their offense at the fastest pace. The packaged play fits perfectly with this mode of attack. Having the exact right look for a play is not necessary because the offense will force a defender to commit to defend one component of the packaged play and the other will be open. Having a quarterback who can make great decisions is critical. The caution has to be to drill it and rep it until it is second nature. At that point, it can become deadly with an uptempo procedure. The whole point is that just about any style of offense can incorporate these two highly effective components to their attack. The list is becoming very expansive. Here are some resources that I have gathered on this topic. I will add more to the blog as they become available. In 2010, Rusty Stiver wrote about packaging jet sweep and screen. In 2009, I reached out to Darin Slack to work one of his camps. I had some of Darin’s DVDs, and I had put together pages of his posts from coachhuey.com into somewhat of a notebook on C4. I really liked the way he set things up and used terminology. It was a reflection of good teaching, and it clarified many of the conflicting or confusing coaching points I had picked up over the years. I planned to learn as much as I could about technique with Darin’s terminology at the camp. I did exactly that. The analogy Darin likes to use certainly applied; it was like taking a drink out of a fire hose. The two-day camp deeply impacted me as a coach. The unexpected impact came in the aspect of the leadership and character that Darin was teaching. The camp was really more of that than football. Football was just his vehicle. What I left focusing on as much as technique was the idea of “servant leadership.”. It’s something that is a huge part of my coaching now, and I wish I saw more of it being coached, especially in youth sports. I have a nine year old son, and I am constantly frustrated when I see the showboating and individualism that is allowed. Kids are being outwardly labeled as “stars” by their coaches to the other kids. I see those kids, “the stars,” pout when they don’t get the ball, don’t get a call by an official, or are taken out of the game. Those kids, who at this point may be superior, need to be taught that their talent needs to be used to serve their teammates rather than the reverse. It’s a disturbing trend. The other concern I have is that development camps like Darin’s are threatened by combines and showcases that put the emphasis on showing off individual talent. There’s a place for those, but it seems that parents are spending their money on that and not taking advantage of great opportunities for their sons to learn the lessons that this game teaches from men like Darin Slack. I know he’s not the only one out there and that there are others who do it as well, but my point is that it seems to be getting tougher and tougher on those camps that have lasting value for a young man. I’ve applied those lessons that I learned from Darin, and I have set up my quarterback manual to reflect it. I will share only the set up and my menu slides. If you want the content, I have included links to Darin’s material at the end of the article. It’s worth every penny for you as a coach and for the young men you serve. 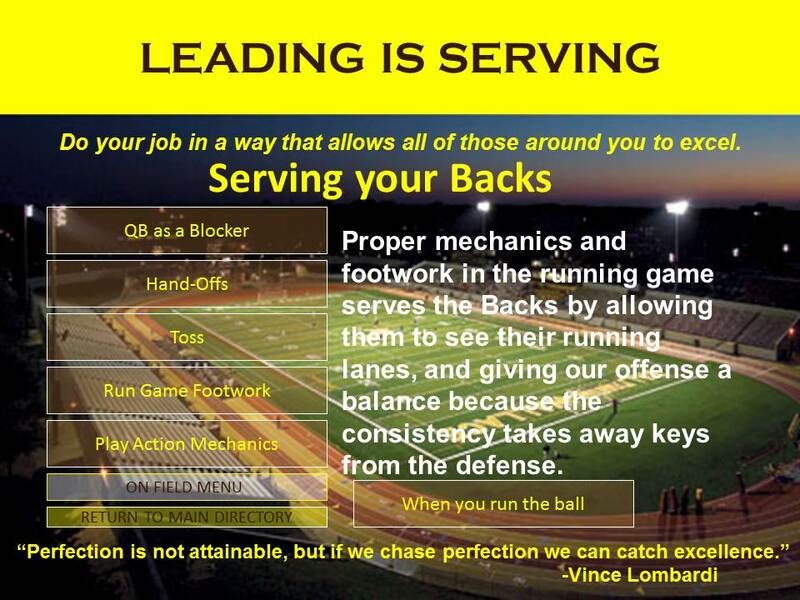 My entire quarterback manual, well over 200 slides, was done with PowerPoint. The entire theme is “servant leadership,” and the entire first section goes into the details of exactly what that is. From that point on it goes into quarterback technique with each aspect of quarterback play designed to serve the other positions on the field. The first slide is something I’ve heard Darin share. 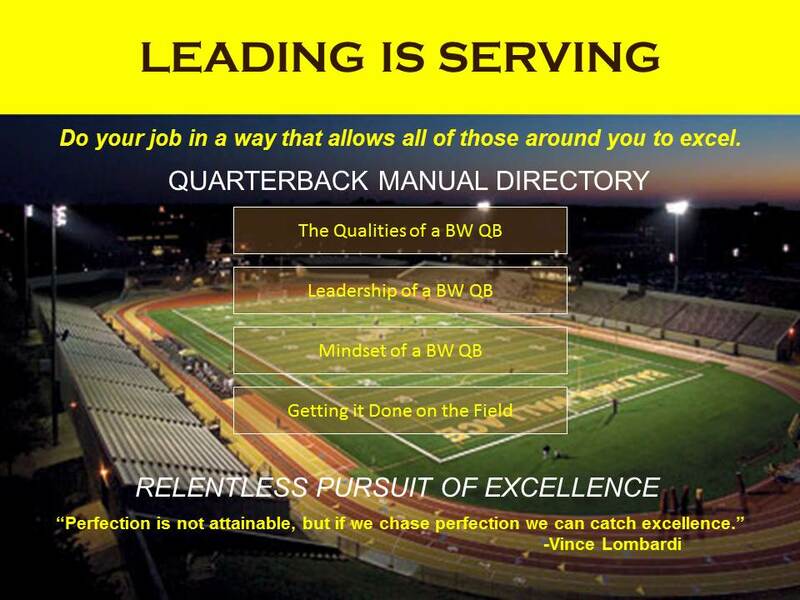 I think the focus this gives at the beginning of our quarterback manual sets the tone for all of the material they will see in the entire manual and how they will be expected to think for their entire career. 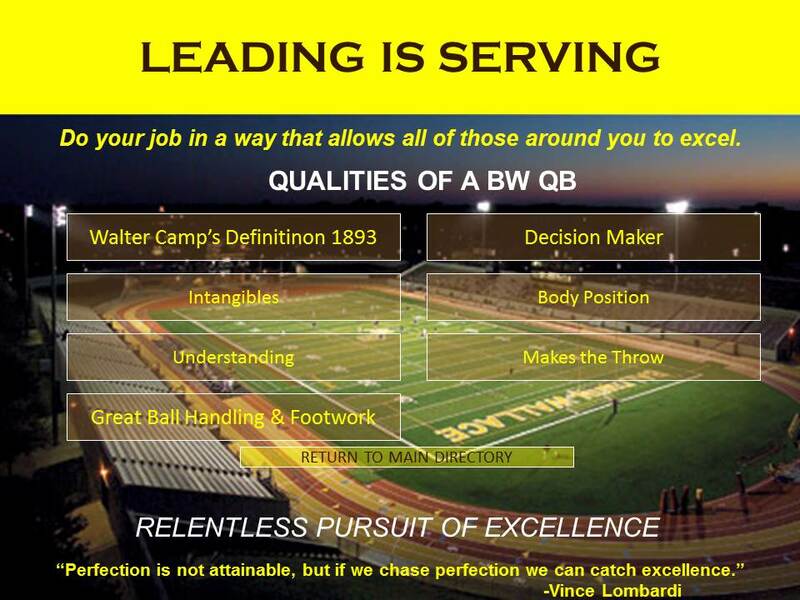 The next section focuses on the qualities and intangibles that we expect out of our quarterbacks at BW. This is a collection of quotes and leadership pieces that I have taken from a number of different resources. I will share these in a future post. The next section focuses on aspects of playing the position. I received these from Andrew Coverdale. He really detailed some outstanding coaching points in these areas for the quarterback. The next section is also a collection of different materials on servant leadership that I borrowed from a number of different sources. The manual then shifts focus to the mechanics and techniques of playing the position. This is essentially Darin’s C4 material with bits and pieces of some other coaching points that I use. You see that it is all set up within a framework of serving other members of the offense. The first section deals with how the quarterback can serve the center and make his job easier: Proper stance, hand placement, and body action on the snap will allow you to begin to execute a perfect play and allows the center the best opportunity to get into his block as quickly as possible. 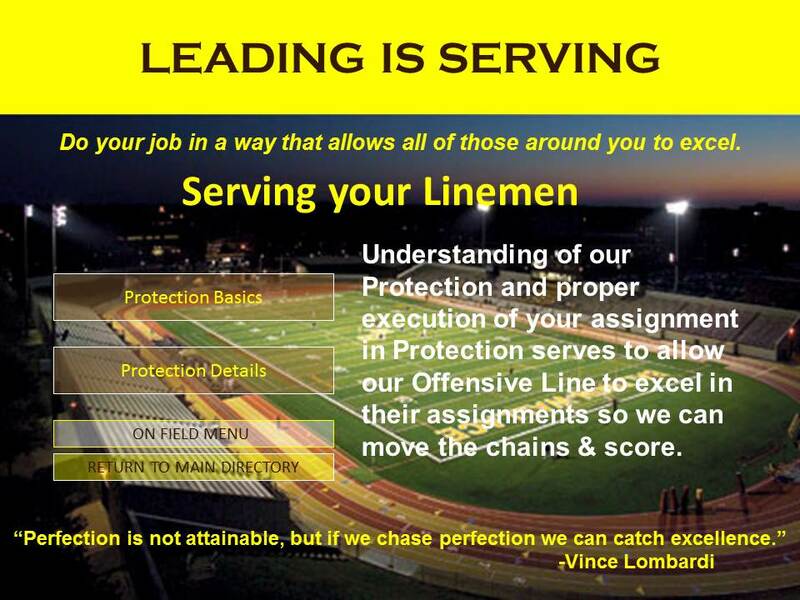 The section on protection focuses on how the quarterback can serve the rest of the offensive line: Understanding of our Protection and proper execution of your assignment in Protection serves to allow our Offensive Line to excel in their assignments so we can move the chains & score. The next section focuses on running game mechanics and how performing those properly serves to help the success of the running back: Proper mechanics and footwork in the running game serves the Backs by allowing them to see their running lanes, and giving our offense a balance because the consistency takes away keys from the defense. The focus shifts to the passing game and throwing mechanics and the quarterbacks role in the success of his receivers: Proper mechanics, footwork, and timing allow the receivers to be successful because we are putting them in a position to win. 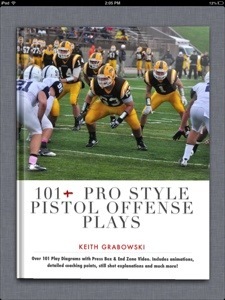 The final section focuses on the quarterbacks role in serving the entire offensive unit: Proper Attitude, understanding of what our opponent is trying to do, and a clear, concise mental approach to executing plays allow you to serve the offensive unit so we can make 1st downs and Touchdowns! At no point in the 200+ slide quarterback manual is the quarterback given even the slightest hint that the team is there to serve him. The lessons on leadership and coaching points for both on and off the field performance indicate that his role is to serve others. 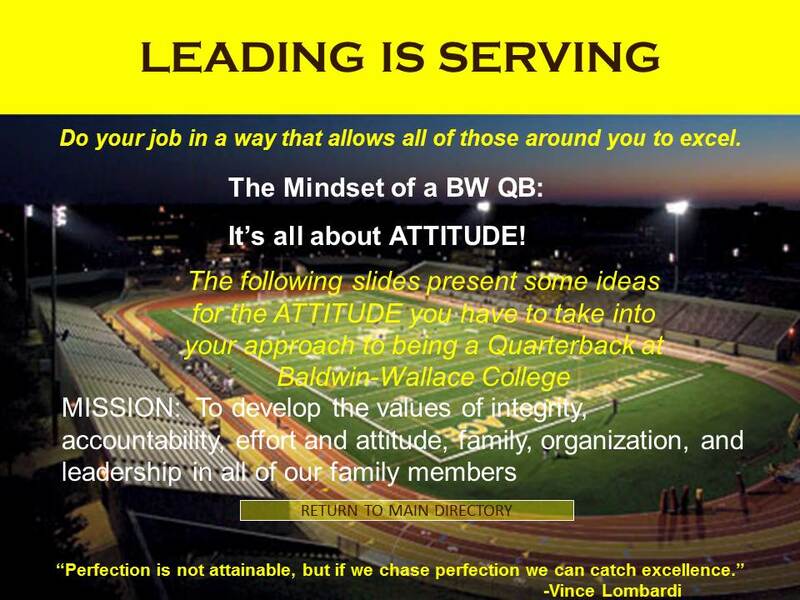 This is an important lesson that will carry our quarterbacks to success as leaders of men both on and off the field. 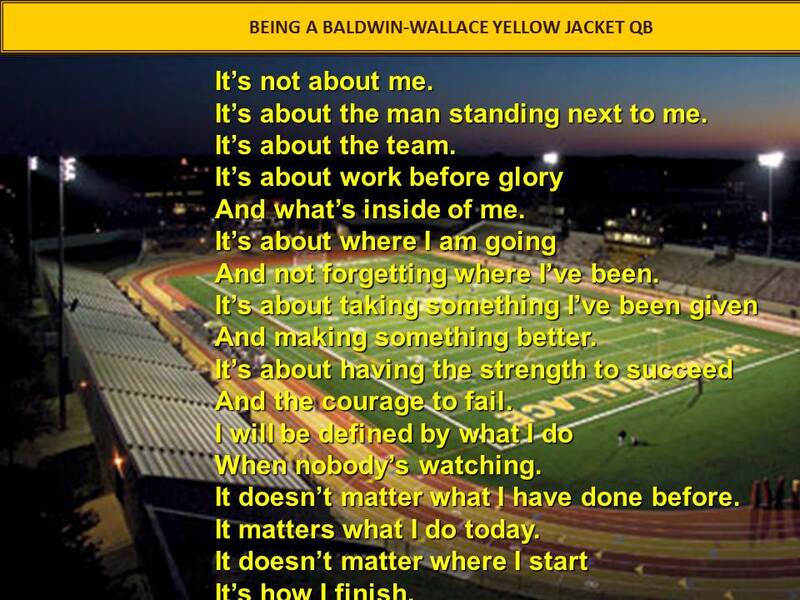 This helps us fulfill the vision of our program: Our players become champions in life and football. We are able to be efficient in teaching our combo because the block applies to both our zone and power schemes. Here are clips of two different phases of our combo drill. In the first we are really emphasizing staying on the block and getting vertical displacement. In the second clip we are working the combo vertically and then coming off to the linebacker. Obviously, with the time we spend on this technique we want to see it show up on film. Here it is in game video on our power play. The left guard and left tackle take the defensive tackle vertically before the guard comes off to the linebacker who has played over the top. Over the last year I’ve learned more and more about using a blog and using social media like Twitter and Facebook. My writing for American Football Monthly is primarily done in the summer, loaded to the WordPress blog, and scheduled for publication (every first and third Tuesday). I’ve used this blog (coachgrabowski.wordpress.com) to do exactly the same thing with most of my writing being done on the weekend or early morning. My blog is set up to tweet about any new article that is published. I really liked the idea, and thought that there had to be something that could schedule my tweets as well. I know many coaches who read this blog use their twitter accounts to keep players, parents, and supporters informed of what is happening in their programs. That’s a great use of twitter. It reaches out very quickly and gets the information you want out there at once. I’m best at doing those types of things, like sending out reminders or messages, first thing in the morning. However, that reminder could easily be forgotten by the intended receiver by the end of the day. This idea sent me on a quest through the App Store looking for a tweet scheduler. I found a free app that did exactly what I wanted called Hootsuite. It does much more than just schedule tweets. It can report and give analytics to people who really rely on twitter for business, but what I really wanted was to plan and have my tweets sent strategically at certain times. The app does that. It is available on a number of different platforms and for the PC. Reminders of deadlines to turn in forms or payments. A quote of the day. Reminders to parents about meetings. Messages to fans and supporters. I see this as a great tool to plan your communication for optimal times to reach the audience that your message targets. You can schedule a series of tweets that lead up to an important event, or a series of reminders, so that what you need your players to do gets done! The app even has an auto schedule function which schedules your tweet for times that your followers are most active on twitter. Hootsuite also functions with Facebook and other social media. I don’t think any of us want to become a slave to the technology. While twitter seems to be a lot of spur of the moment random thought, there’s no reason you can’t turn this into a very effective tool for planned and organized communication.